This story has an interesting twist. 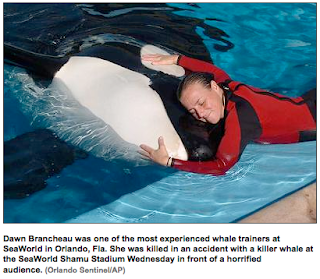 Sea World has said it has no intention of killing the animal, which surprised me. It seems to me the usual way of dealing with animals that kill humans has been to exact retribution--odd as that is, considering that animals are (surely) not responsible for their "crimes." But no--the orca will stay. Stay forever? Stay on display? We'll see. I've always loved visiting zoos and aquariums, so it's with regret that I've come to see them as indefensible (though I can't say I'll never go again). From a child's point of view, an elephant in a cage and an orca in a tank are more or less in a natural habitat. When we grow up (literally and figuratively) and learn about the lives of animals, we come to see that zoos and aquariums are horribly restrictive prisons (particularly for large mammals)--as much as they're fun places to visit. I was going to email you about that post, checked here first, no need to email. One of the elephants at Hohenwald killed a volunteer a couple of years ago. I'm not so sure that we can whole heartedly just dismiss zoos as animal prisons. They do a lot of work in the area of conservation, and raise awareness of wild animal populations. The last time I went to the zoo, virtually every exhibit gave us environmental context of the animal's natural habitat, and almost all of them attempted to raise awareness of habitat destruction by various human activities. Some exhibits had little donation boxes that you could drop some money in to help support the conservation efforts of the animals in the wild. These are good things no? And if a couple of elephants can act as ambassadors for the rest, and must sacrifice some of their happiness, isn't that okay? After all they do get excellent medical care, we get research animals so we can learn to care for wild animals better, and the zoo animals don't have to worry about predators (typically). I posted my comment before reading the link. But even after reading it, I'm not sure the criticisms stand. Especially when it comes to some zoos, (not so much sea world). Macken's imaginary biologist is an obvious hyperbole. We can learn lots about giraffes in a zoo, which consequently can make us more aware and more caring about them in the wild. Like it or not, humans are increasingly becoming conservators of the wild. But if we don't know how to care for these animals, we'd simply become a 2 year old babysitting for a 1 year old. Interesting post. You inspiried me to write something about it too. Maybe they'll release the orca? Off topic: AMOS, are you okay?! I just read the news about the 8.8 earthquake. Amos, I'm wondering the same thing. Ophelia--I guess I'm remembering this from a while back--the whole drama of a cougar (eg) killing someone, and then being captured and killed as if a criminal. It seems like zookeepers' sensibilities have changed over the years. Wayne--OK, the "prison" talk is a bit colorful, but I think it's true that zoos have a devastating effect on quality of life for many species. There are benefits as well (making the public care about these species, etc etc) but at a very high cost. Crystal--I'm really surprised to read that the show has already gone on. That orca is not going to be released or "punished"! Rtk: Thanks. I'm ok. Some minor problems, but earthquakes kill the poor. This earthquake is stronger than the one in Haiti, but only 80 deaths so far. The difference is better building standards and I assume that the only houses which collapsed in Chile were those of the poor. Amos, That's good news. Not sure about "only the poor" though. There's a picture of a new apartment building lying on it's side in today's New York Times. Jean: That building is a national scandal. There are good building codes here, although some people cut corners and apparently, they cut many corners in building that apartment building which collapsed. Today they are trying to rescue the people in that building, but are finding only dead bodies. Otherwise, as I say, the buildings that collapse are very old houses built before anti-seismic building codes, where only poor people live or houses which are constructed by those who live in them out, that is, by the poor. That makes sense. If you wanted to put a guest post on my blog about what's going on there that would be awfully interesting. But quite possibly you have much more pressing things to do right now. Just send by email and I'll put up whatever you like. Thanks, Jean, but I don't always have internet. It comes and it goes, so it's not a good moment for me to blog. In general, this was a very serious earthquake, 8.8 in the south of Chile and 8.0 in Santiago. The Haitian earthquake was 7.0, and the scale increases geometrically, that is, the Chilean earthquake was several hundred times stronger than that of Haiti. Lots of people still without water and electricity. Cell-phone service is only half working. Airport is still closed. Supermarkets closed. Looting. Some looters may need food, but in some places, they're looting with trucks, taking TV sets, etc. I never thought that I'd hear the Radio Bio Bio, an excellent progressive radio station, with 24 hour coverage since the quake, call for the army to take control (after 17 years of military dictatorship, under Pinochet), but they are right. In the south of Chile there will be curfew tonight, with the army in charge. I'm okay. We have food for several weeks, although we may have to eat a vegan diet, rice and beans out of necessity, since that is what we have stocked. Wow. Good to hear you are OK Amos. Take care of yourself. Amos, That's a great update, actually. Would you mind if I put it in a post? Let's me add a few details.